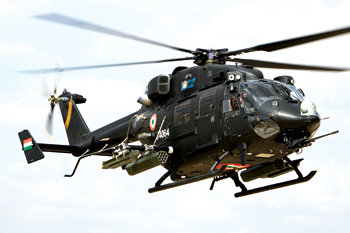 April 6, 2015: Saab, which recently bagged a $78 million follow-on contract from Hindustan Aeronautic Limited (HAL) for serial production of an integrated electronic warfare self-protection system for installation on the Indian Army's and Air Force's Advanced Light Helicopter Dhruv, has revealed it is considering local production of the IDAS system in India, given the large potential demand for such a capability. Saab's IDAS is an EW system designed to provide "self-defence in sophisticated, diverse and dense threat environments. IDAS can be configured to become the high-end system with laser-warning, missile-approach-warning, as well as full multi-spectral detection capability for radar. The system is fully integrated with the BOP-L countermeasures dispenser." Production of the IDAS system for the Indian Dhruv will take place at Saab in Centurion, South Africa (Saab Grintek Defence), with deliveries set to take place from this year till 2018. The Saab leadership in India has however revealed that the company is actively scouting an opportunity to build the IDAS system in India, to service Indian and Asia-Pacific requirements. The IDAS has proven service on several platforms including the Saab 2000, Agusta-Westland A109, Super Lynx 300, Boeing CH-47 Chinook, Denel Rooivalk and Oryx, Eurocopter Cougar, Puma & Super Puma, NH Industries NH90, C-130 and L100 Hercules, Sukhoi Su-30MKM. The system could be under consideration for future platforms being developed in country too.